A: No, we take care of all necessary licensing. 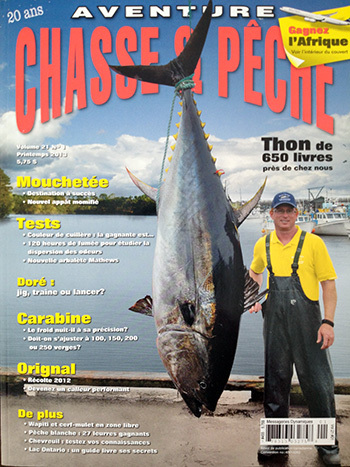 Q: Do I get to keep the Bluefin tuna I catch on my fishing charter? 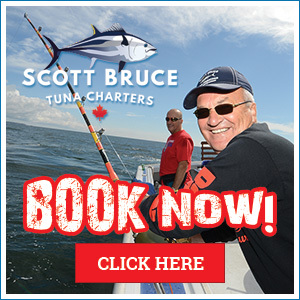 A: Scott Bruce Tuna Charters belongs to the PEI Chartering Association, which allows its members to operate as a catch and release fishery. On PEI, there is a commercial tuna season which allots one tuna per commercial fisherman and the captain owns that fish. Any small fish such as mackerel or herring caught during a tuna or deep sea fishing charter can be filleted and bagged for you to take home. Q: What should I wear and bring on my fishing charter? A: It is important to dress comfortably and for the season. During the summer months of July and August, you may want to wear shorts and a t-shirt. However, it is also recommended to bring long pants, a shirt and a jacket because the weather temperatures on PEI can be unpredictable. It is also advised to bring a hat, sunglasses, sunscreen and a camera to capture your fishing memories. It is not necessary to bring a fishing rod. All rods, reels and tackle are provided however if you prefer to use your own gear we will be happy to accommodate. Q: When is the tuna season open? A: The tuna season operates from mid July to mid October. It is recommended to book your fishing charter early to avoid disappointment since many dates are reserved a year in advance. Q: Where are you located and what is the closest airport? A: We are located in Prince Edward Island, which is situated off the coast of Nova Scotia, Canada. Charlottetown Airport (www.flypei.com) is PEI’s largest and main airport. Airline carriers Air Canada, West Jet and Sunwing operate out of the Charlottetown Airport. Car rentals are available in this airport. Halifax Stanfield International Airport (www.hiaa.ca) is an international airport located in Nova Scotia. It is a 3 hour 30 minute drive to Charlottetown, PEI from Halifax Airport. Depending on where the tuna are, we fish out of Fortune Harbour or North Lake Harbour. The closest town to these two harbours is Souris. Fortune is about a 10 minute drive to Souris and North Lake is about a 20 minute drive past Souris. Charlottetown is a 60 minute drive to Souris. Q: Do you require a deposit and what is your refund policy? A: We request a 25% deposit of the total charter cost. The percentage requested will be higher for those booking 7 or more fishing days. We understand plans change. If a reservation is cancelled 30 days prior to the scheduled charter, we will refund the full deposit. We accept cheque, Visa, MasterCard, etransfer and PayPal. Q: How far do we travel from shore to catch Bluefin tuna? A: Normally 2-3 miles but we may also be 20 miles from shore. Q: What time do we leave the harbour to go tuna fishing? A: Since we operate private fishing charters, we are able to accommodate your personal schedule. We usually recommend early morning as the best time of day to start but we suggest you give us a call a day or two before your scheduled fishing date to set up an exact time to meet. It is also good to touch base prior to your fishing charter to review upcoming weather conditions.